Luxury barge river cruise vacations on the Italian hotel barge LA BELLA VITA. 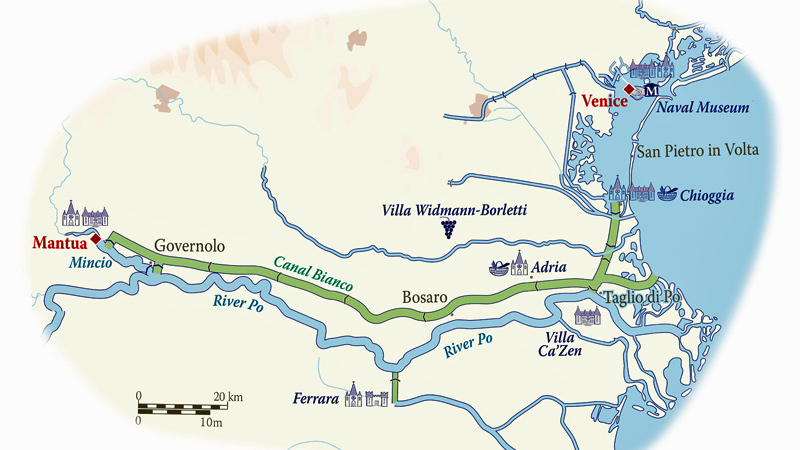 Cruise Venice, the Islands of the Venetian Lagoon, the Bianca Canal and the Po Valley. Treat yourself to a barging holiday and enjoy this splendid area of Italy. The Opera itinerary is for 7 nights and commences Saturday August 10, 2019 - Includes one hotel night in Verona (August 10), a visit to the fascinating Arena Muse Opera, a wonderful museum devoted to the history of opera, followed by dinner in the delightful courtyard restaurant, and a performance of Puccini's "Tosca" at the Arena di Verona (best seats in the House). The opera-themed cruise aboard La Bella Vita continues for 6 nights August 11-17, 2019) between Venice and Mantua. Guests are met at the meeting point in Mestre or Venice on Saturday afternoon and transferred to the Hotel due Torri in Verona. Early evening, we drive to Verona for a visit to the fascinating Arena Muse Opera, a wonderful museum in the magnificent setting of Palazzo Forti and devoted to the history of opera. There, we also have dinner in the delightful courtyard restaurant, before making our way to the nearby Arena di Verona, a Roman amphitheatre built in 30 A.D., where we watch a performance of Puccini's "Tosca" from the top-priced front stalls seats. At the end of a memorable evening, we drive back to the hotel. After breakfast in the hotel, we enjoy a guided tour of Verona, before driving to Venice to board La Bella Vita for a Prosecco Welcome. After lunch, an afternoon cruise takes us along the Giudecca Canal past some of Venice's most famous monuments: the Chiesa del Redentore, the impressive Basilica di Santa Maria della Salute and the Punta della Dogana to our mooring outside the Naval Museum. There is time for a stroll to St Mark's Square and a brief tour of the Doge's Palace before dinner on board. After a stroll or cycle along the 18th century Istrian sea wall in Pellestrina, we cruise to Chioggia, city of Goldoni's plays. Here we visit the picturesque town centre and colorful fish market. We also see the Cathedral and the Piazzetta Vigo before cruising on to the River Po delta. Passing through a nature reserve with flamingos and occasional heron, snipe and other wildfowl, we travel upriver to Taglio di Po for dinner ashore hosted by the owners at the beautiful 17th century Villa Ca'Zen, a private stately home by the river where Lord Byron courted the Countess Giuccioli and wrote some of his best poetry. Morning excursion with a guided tour of the Renaissance city of Ferrara. Here, we tour the Teatro Communale, built in the late 18th century and boasting a majestic 5-tiered auditorium. We also visit the 'Camerino delle Duchesse', a truly delightful private room in the Ducal Palace decorated in the 16th century for Eleonora and Lucrezia d'Este. We see the 14th century Estense Castle with its moat, drawbridges and marble balconies, the fabulous 15th century frescoes in the Schifanoia Palace and the cathedral façade with its sculpted images described as an illustrated Bible. Return to the hotel barge for an afternoon cruise past villages and farmsteads to Governolo and dinner on board. Our final cruise has a dramatic approach to Mantua, a Renaissance city with a captivating lakeside setting and home to Verdi's opera Rigoletto. Mantua displays extraordinary neo-classical and baroque architecture, portrayed in the 14th century Ducal Palace housing some 15 gardens and courtyards, a museum, basilica, intricate frescoes, the Gallery of Mirrors and the exquisite Rivers Room. We explore the city further, finding "Rigoletto's House" near the cathedral, then finally, we visit the intimate Teatro Bibiena, a delightful baroque theatre with a bell-shaped interior that opened with a concert by a 13-year-old Mozart in 1770. A wonderful finale to our Italian opera adventure. Captain's Farewell Dinner on board. This is a sample itinerary and subject to change. On alternate weeks the cruise is in reverse direction.